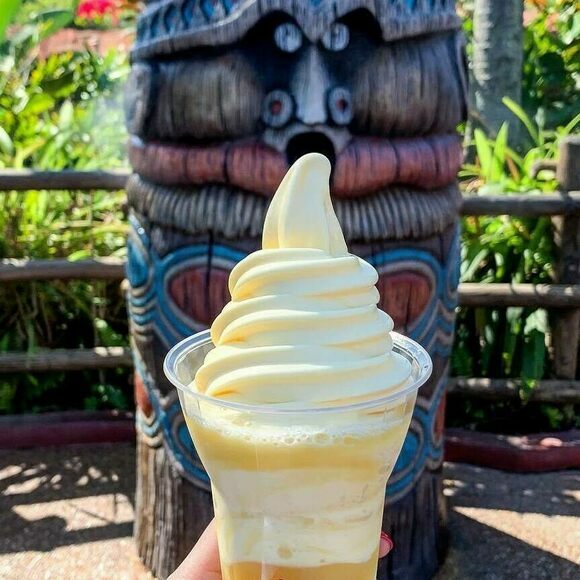 This pineapple soft serve has a cult following at Disney theme parks. In 2016, Disney Parks and Resorts sold more than 3.4 million cups of Dole Whip. A cult following surrounds the signature silky pineapple soft serve, which is heavily associated with the iconic theme parks. Dole started selling the tropical treat at Disney World in Orlando, Florida, and Disneyland in Anaheim, California, in the mid-1980s. The produce company had been the official sponsor of the Disneyland’s Enchanted Tiki Room since 1976, but the original fruit stand sold only pineapple juice and spears. Within a couple years, the soft serve—offered either plain or as a pineapple juice float—had found tiki-themed homes inside both parks. Today, visitor demand is so high that lines for the dairy-free dessert can rival the queues for actual rides. The fanfare surrounding Dole Whip at Disney theme parks is undeniable, regardless of the fact that enthusiasts can get the same product elsewhere. Disney’s resorts across the United States serve it, but so do bars, colleges, restaurants, and frozen yogurt chains such as Menchie’s. Outside of Disney’s reign, purveyors often refer to the same product as “pineapple soft serve.” Disney just uses the moniker Dole Whip at certain sponsored outposts, but there’s nothing different about it other than the name (and the magic, of course). Dole produces six other flavors of the same product—orange, lime, mango, raspberry, strawberry, and lemon. The lattermost offering caused total pandemonium at Disney California Adventure in 2018, when its debut at Pixar Pier created immediate, massive lines outside the Monsters Inc.–themed “Adorable Snowman Frosted Treats” stand. Head to the Enchanted Tiki Room in Adventureland for two windows selling Dole Whip. Find Dole Whip at Aloha Isle and at Pineapple Lanai in Polynesian Village. This flashy tiki bar located off the Vegas strip serves boozy Dole Whip floats. This dark, sweet refresher was born at a now-defunct amusement park on the shores of Lake Erie. This spicy street food has a reputation for making people cry. In the Andean highlands, clay makes bitter potatoes more palatable. Most sushi fans have never tried this rare rhizome.